What do you get when hippie vibes and Star Wars collide? That’s easy, a Millennium Falcon flower crown. You know, the ship that made the Kessel Run in less than twelve parsecs. I’m headed to Bonnaroo this week, so I’m in preparation mode! 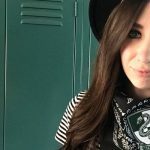 Last week I shared a tutorial to make a Harry Potter bandana, and this week it’s all about the flower crown. 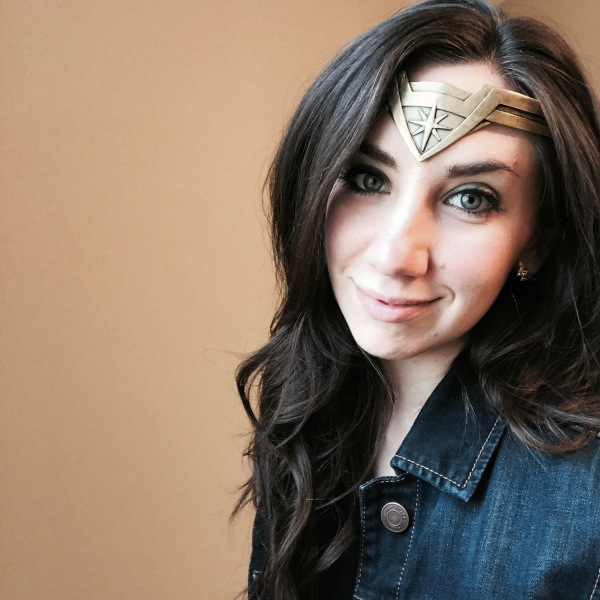 Two music festival fashion staples with a geek chic twist. 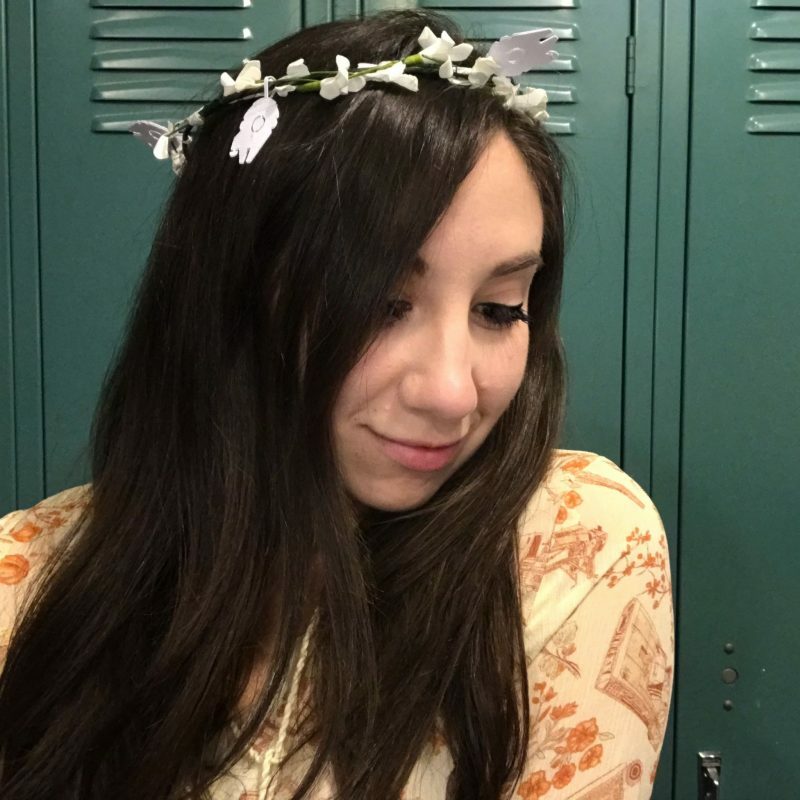 First thing you’ll do is make the base of your flower crown. Take your thick, covered floral wire and measure it loosely around your head. Make sure that there is a little extra room between the wire and your head since other materials will be added. You do not want your crown to be too tight. Once you have found the width you’d like your crown to be, cut your wire using wire cutters or another tool. 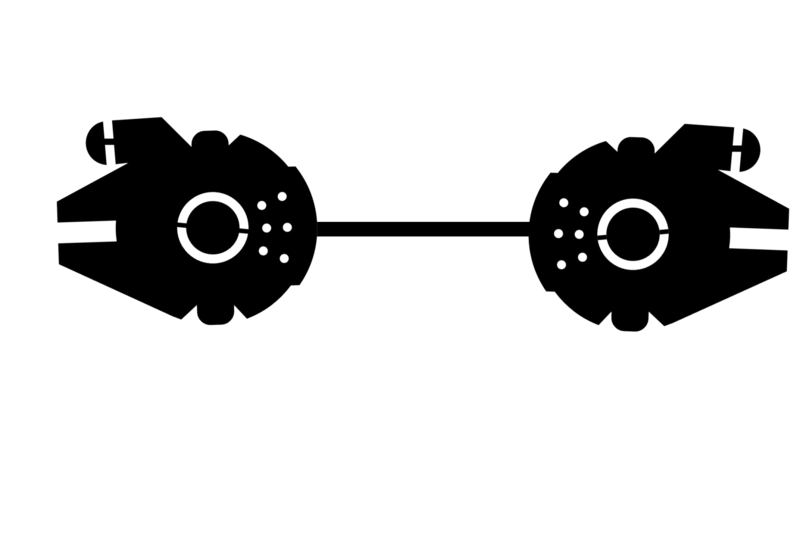 To connect your thick wire and make a circle for the crown, cut a piece of thin wire, about 3-4 inches long, and wrap it tightly around both ends of the thick wire to create a circle. Use the flat part of your wire cutters to gently push down the ends of the thin wire so that they aren’t sticking up and jabbing your head (be careful, they’re sharper than you would think!). 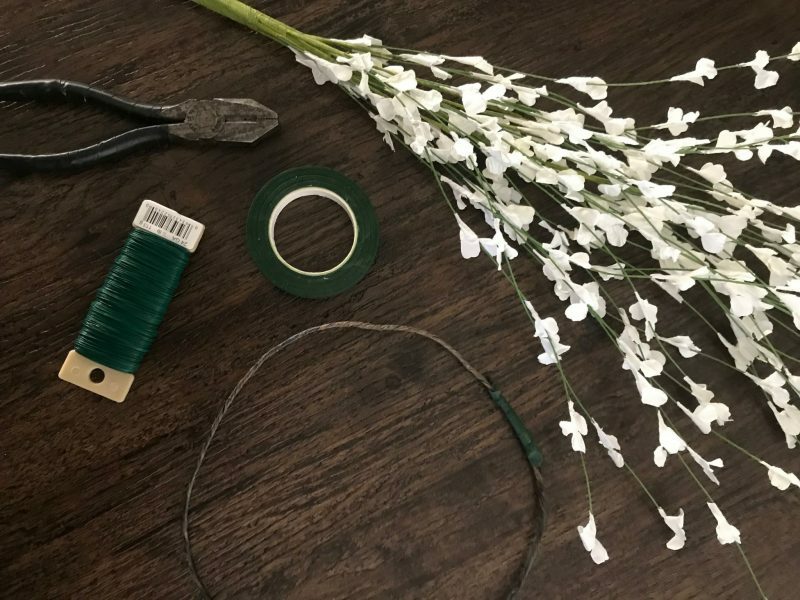 As a next step, use a small piece of floral tape to cover the ends of your thin wire, helping to cover the sharp ends of the thin wire which may be exposed. I purchased a bunch of small, dainty white flowers on green stems. The flowers almost have a paper consistency to them which I thought would match my paper Millennium Falcons well. However, the flowers you choose are completely up to you! 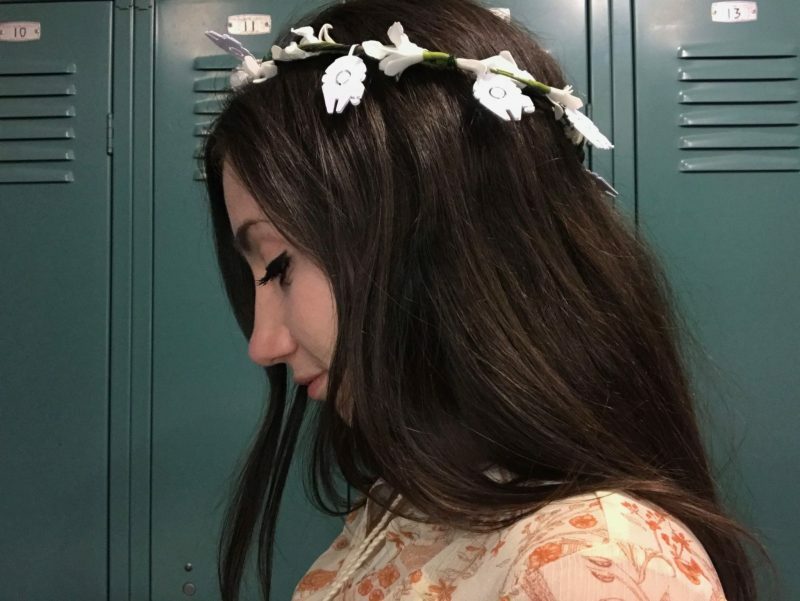 Your flower crown is all about you. So choose whatever you’d like, the tutorial will still apply. I started by cutting several strands of my flower bunch from my bouquet. Each strand was around 9 inches or so. 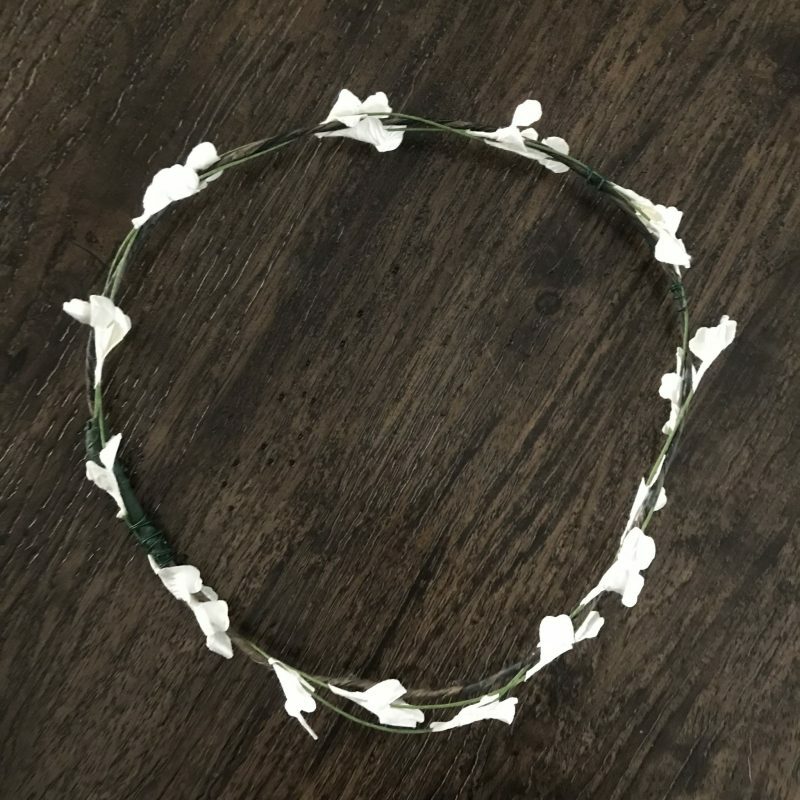 Starting at the base of my flower crown, where I had used the thin wire to connect the ends of my thick wire, I weaved and wrapped my flowers around my crown. 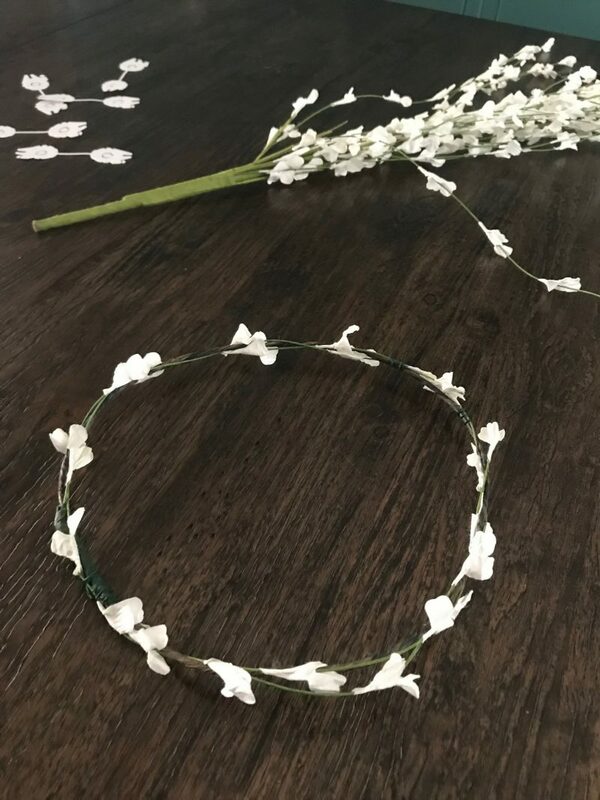 To secure your flowers, cut a small piece of thin wire, around 3 inches or so, and wrap it around the end of your floral strand to secure it to your crown. 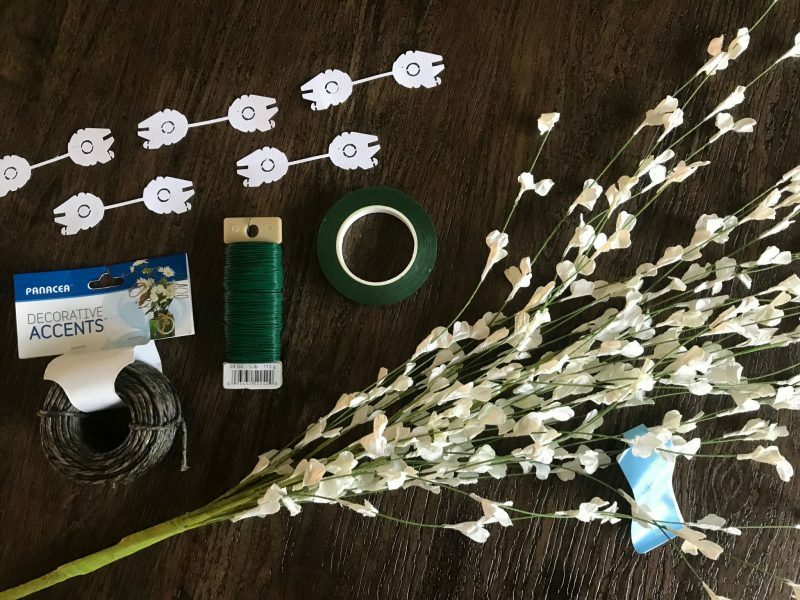 Continue this process until you have as many flowers attached as you would like. If your floral strands overlap each other, no worries. Next, use the flat part of your wire cutters to flatten the sharp, poky pieces of thin wire. If any pieces still feel sharp and exposed, wrap a small piece of floral tape around them to cover the sharp edge. Next, set your crown aside. It’s time to prepare your Falcons. While I used my Cricut Explore Air 2 to cut out my Falcons, it would be possible to cut yours out by hand using my file as a stencil. However you choose to make yours, you can download the Millennium Falcon file here. I used 8 Millennium Falcons on my crown that were 3.5 inches in length. Once they are cut out, carefully fold your Falcons in half so that the ship lines up when folded. 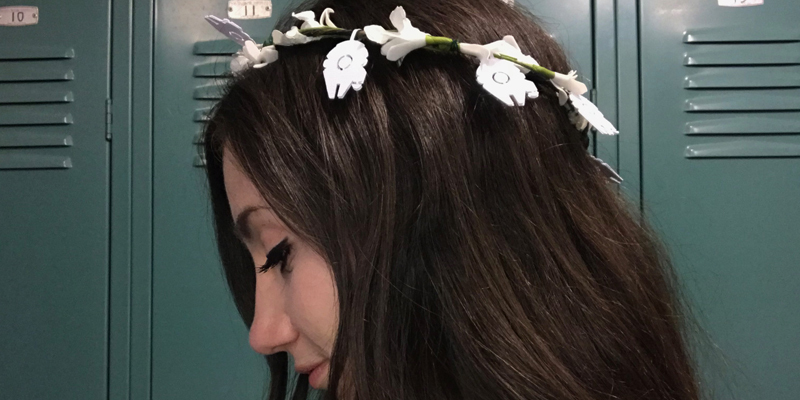 To add them to my flower crown, I used a hot glue gun. 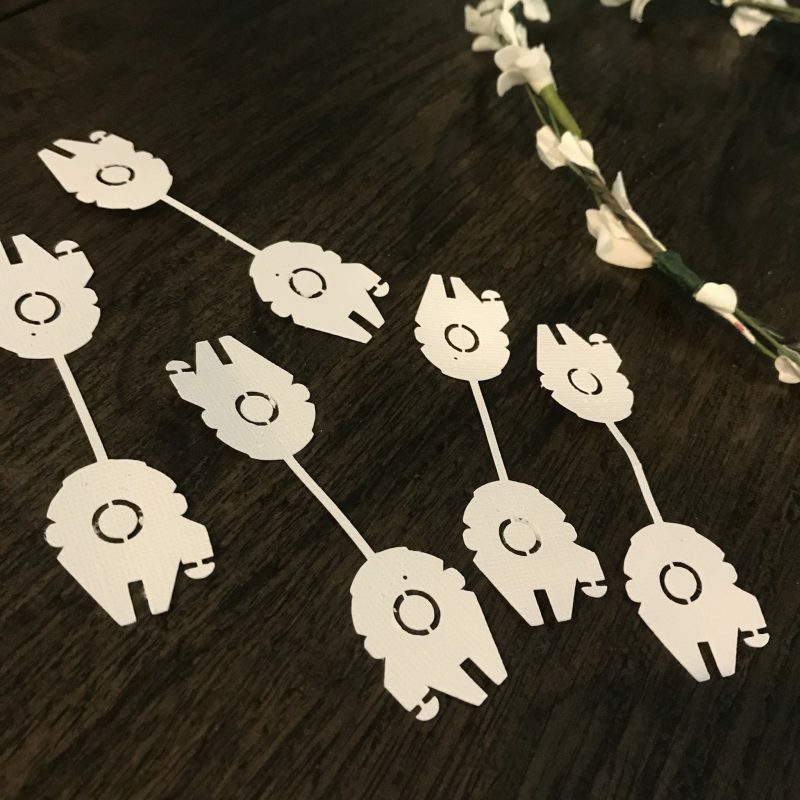 After folding and lining up your Falcons, place one around your flower crown base and apply several drops of glue to the inside of it. Carefully re-fold your paper to now align both ships, and thus securing it around the base of your crown. Note — I didn’t worry about gluing my paper Falcons literally to my flower crown base. I just glued the insides of the paper ships together. 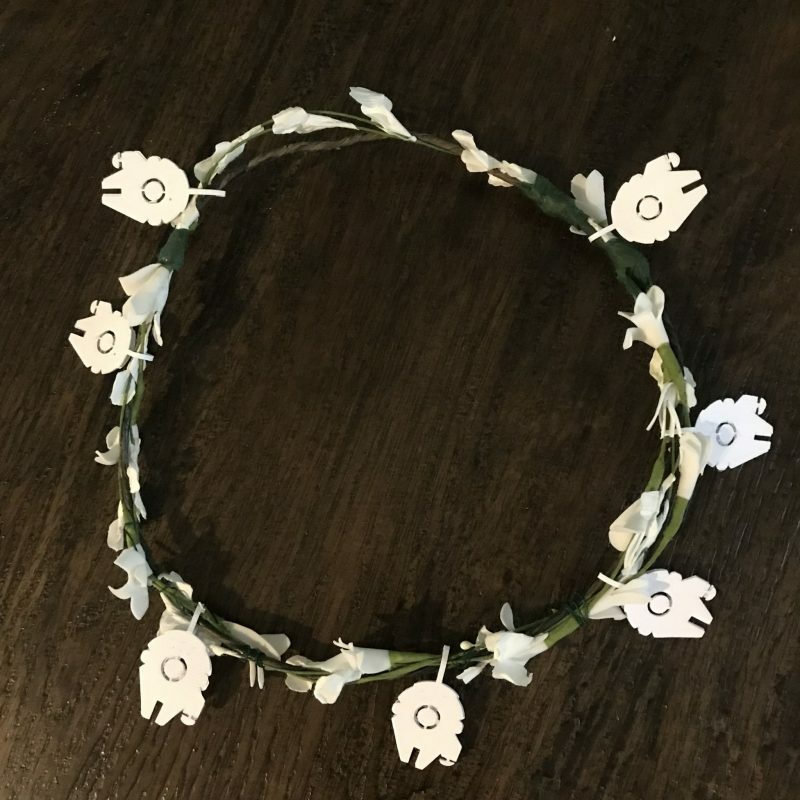 This allows your crown to be a bit more free and flowy. 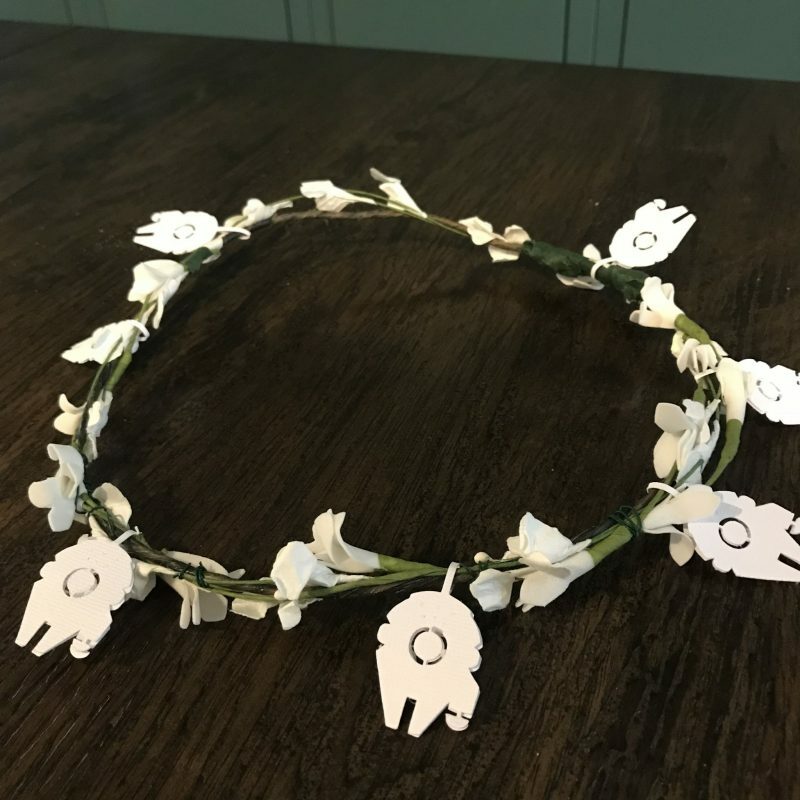 Once your hot glue has dried and you’ve added all of the flowers and ships to your liking, your adorable, galactic Millennium Falcon flower crown is complete! P.S. 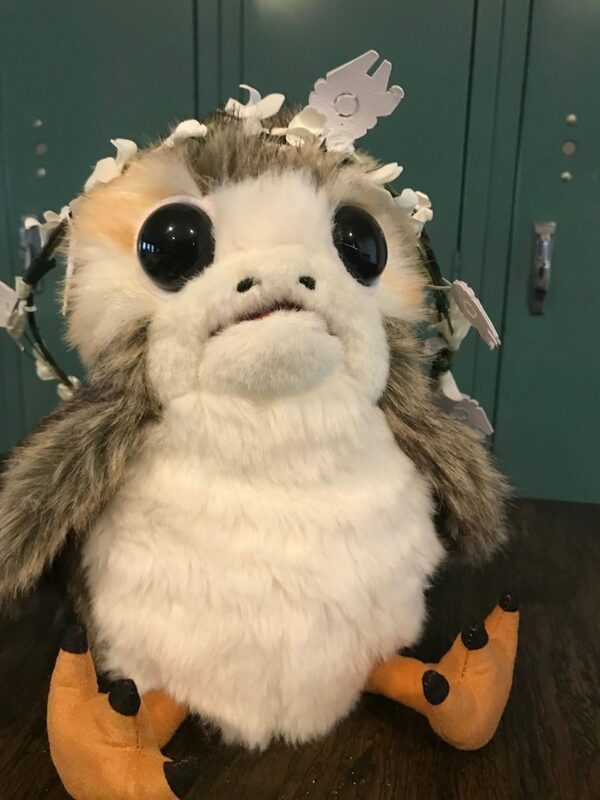 Porgs like flower crowns too. Looking for more Star Wars DIY ideas? 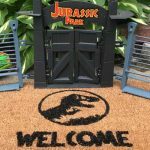 Check out my Chewie, We’re Home Welcome Mat tutorial. This is so cute. Have a fun time at the music festival! You did such a fantastic job with this! Thank you so much! Porgs deserve flower crowns too. 🙂 Maybe next I’ll do a flower crown with porgs on it! Now that’s very creative! I would never thought of that. I will keep this in mind for Halloween for sure! This is so unique and so clever! I love it! Thanks! That was exactly what I was going for! 🙂 You know I am always looking for an excuse/opportunity to work Star Wars into my outfit.